The Military Times’ 2017 Service Members of the Year made the HillVets 100 list this year, the first time all five have been featured. In its fourth year, HillVets 100 honors members of the military community across 20 different categories in the hopes of facilitating networking that can help strengthen the veteran community. “This is an effort to really take a broad look at the veteran community and those that support it,” said Justin Brown, founder of HillVets, a non-profit organization whose mission is to empower veterans and support their educational and career goals. The categories range from “Capitol Hill,” to “Warrior Athletes,” to “the Arts,” to try to ensure the list includes people from all industries and areas of interest. They highlight all 100 recipients collectively to encourage networking that will build “positive momentum for better, bigger, positive change for veterans,” said Brown. “It’s really easy to always kind of surround yourself with people who are in the same industry, it’s a little more difficult to find people who are in the top of their game in a completely different industry,” he said. 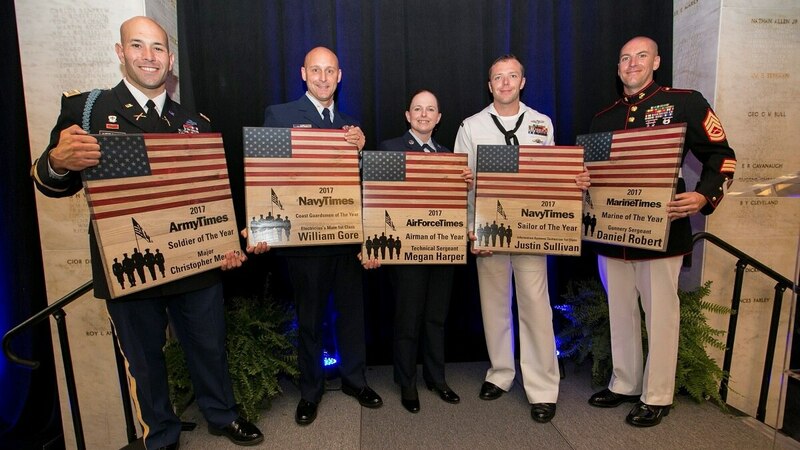 As influential members of the military community, the Military Times’ 2017 Service Members of the Year will be honored at the Annual HillVets 100 Tribute Gala in March for their compassionate work for the military and civilian communities. Maj. Christopher Mercado, the Army Times winner, co-founded Objective Zero Foundation which provides suicide-prevention resources to troops, veterans and their families. The foundation also offers the Objective Zero app, which provides users with people they can talk to via a message, video or phone call. Marine Corps Times winner Gunnery Sgt. Daniel Robert leads the Silent Drill Platoon and has volunteered with Special Olympics for 10 years. Information Systems Technician First Class Justin Sullivan, the Navy Times winner, volunteer coached the Naples Tiger Sharks Swim Team in Italy, accumulating more than 1,400 hours, and has spent almost 380 hours volunteering with the Naval Sea Cadets Corps as a teacher, mentor and safety observer. Tech. Sgt. Megan Harper became the ninth woman in Air Force history to finish the elite security forces Phoenix Raven program, which trains airmen to secure aircraft while in flight and provide ground security when those aircraft land in dangerous areas. She also volunteers regularly with organizations that support veterans, at-risk underprivileged youth and LGBT troops. She is the 2017 Air Force Times winner. Electrician’s Mate First Class William Gore, the Coast Guard winner, and his wife founded Danilo’s Cares, a nonprofit organization that has provided 3,000 impoverished Honduran children with free dental care. The Annual HillVets 100 Tribute Gala will take place on March 29 at the U.S. Chamber of Commerce in Washington, D.C.
Military Times is the official media sponsor for HillVets 100.